Come and take a peek into Christmas past! The pages of An Old-Fashioned Christmas: Tinsel, Gingerbread Men and Raggedy Ann beckon a remembrance of Christmas past and invite readers to take a nostalgic glance backward to a period of time when rotary-dialed telephones, cloth diapers, and percolating coffee pots were part of daily life. Ninety images are included in the hardcover, coffee-table book which features Norman Rockwell paintings and vintage toy ads (Mr. Potato Head, Lionel Trains, Schwinn Bikes, Howdy Doody, etc.) along with authentic black-and-white photographs taken during this period of time. Image examples may be viewed at www.OFCBook.com. This website provides an in-depth look at the book. 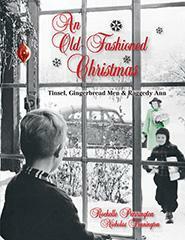 An Old-Fashioned Christmas captures the spirit of the bygone holidays between 1930 and 1960. The book’s heartwarming text highlights a period when Christmas feasts were prepared from canning jars lining pantry shelves, and holiday shopping began by paging through a Sears & Roebuck catalog. Hand-written letters addressed to the North Pole were filled with wishes for record players and jack-in-the-boxes. An entire chapter detailing the Christmases of World War II during 1941, 1942, 1943, and 1944 is also included in the book. Rochelle Pennington is available for speaking engagements on this title. Her power-point program includes many of the vintage photos and images included in her publication. In addition to a power-point presentation filled with history and humor, Pennington brings along items from her antique toy collection, as well as other antiques pertaining to Christmas. A few of the additional items include an original Bing Crosby “White Christmas” album, cookie cutters, aprons, vintage Christmas cookbooks, hat boxes, holiday hankies, Christmas cards, tinsel, angel hair, ornaments, and bubble lights. Pennington’s programs in Wisconsin will feature added information on Billie-the-Brownie, Santa’s favorite elf, who was a character dreamed up by advertising executives in the late 1920s at Schuster’s Department Store in Milwaukee for a promotional campaign. (The store later merged with Gimbels.) The little elf burst into fame so quickly that by 1931 he had his own radio program, airing daily at 5:00 p.m. between Thanksgiving and Christmas for over twenty-five years! Billie became as much loved as Santa Claus to children growing up in the northern Midwest during this time as he brought stories of the North Pole to life. Wide-eyed children listened breathlessly, plopped down on their tummies in front of radios. An Old-Fashioned Christmas includes a CD of an original Billie-the-Brownie radio broadcast. Youngsters will be thrilled to hear Santa Claus and Mrs. Claus speaking! 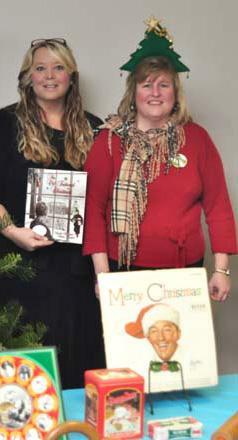 Rochelle Pennington presented "An Old-Fashioned Christmas" to patrons of the Muehl Public Library. She is pictured above with the library’s director, Elizabeth Timmins.